We hope to strengthen the identity of the Access Panels as a Network and provide one simple website interface which Panels can work with easily. We call this Panel Town. The common layout for all participating Panels will also improve portability and communication for disabled people across Scotland. Panel Town offers the opportunity to engage with other Panels through blogs and other means. This provides the chance for Panels to share information, ask questions and get support. 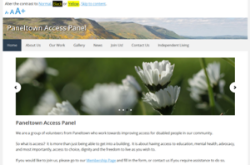 We have developed a template which we use to create websites for Access Panels. Working with a web developer we will create Access Panel websites for free which will not only meet the Panel’s needs but identify it as being part of the Access Panel Network. Lastly, we are offering training on the website software, WordPress. The training is provided by Insight Training. The training doesn’t take long and feedback has been really positive. Look at the bottom of the page to find out how to book your training. If you are interested in creating a new Access Panel website, or want to switch your current website over to WordPress, please contact Ian Buchanan at SDEF who will be happy to take you through the process.